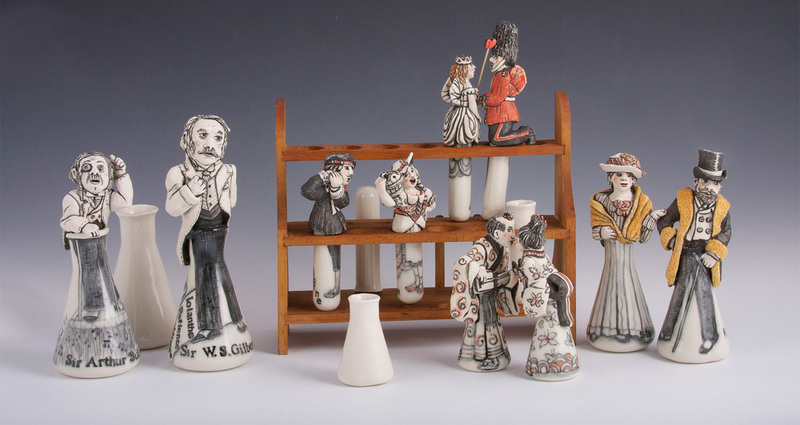 I am experimenting with an old chemistry set and the lively characters found in the operettas created by the British theatrical partnership of Sir W.S. Gilbert (the comic Librettist, 1836-1911) and Sir Arthur Sullivan (the composer, 1842-1900). Both men are shown in the large Erlenmeyer Flasks; Sullivan is conducting with one finger, and wearing a monocle. 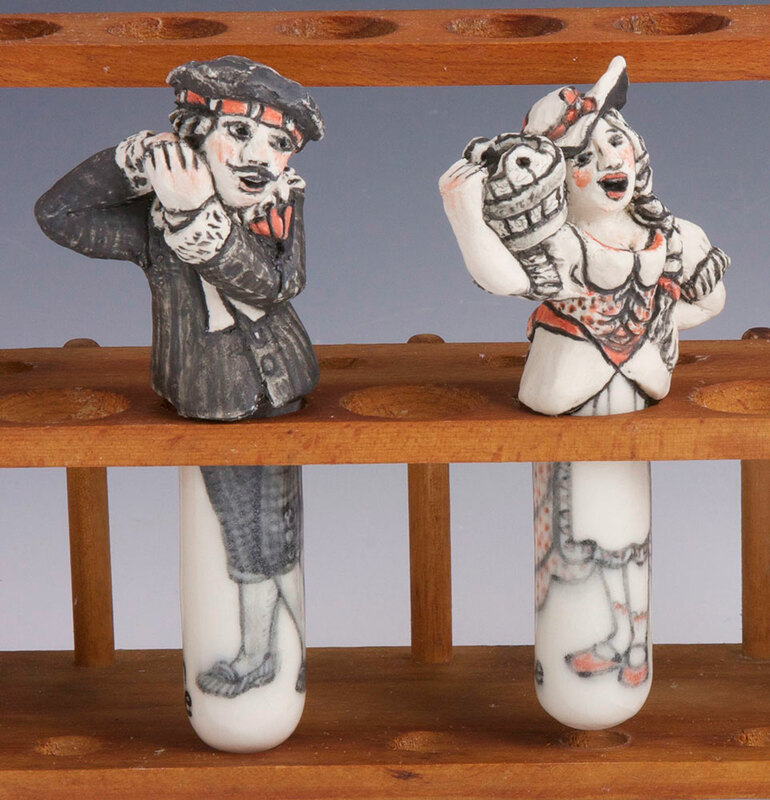 On the upper tier of the wooden rack, in test tubes, are the “Fairy Queen” and her love interest “Private Willis” – characters in the operetta Iolanthe. 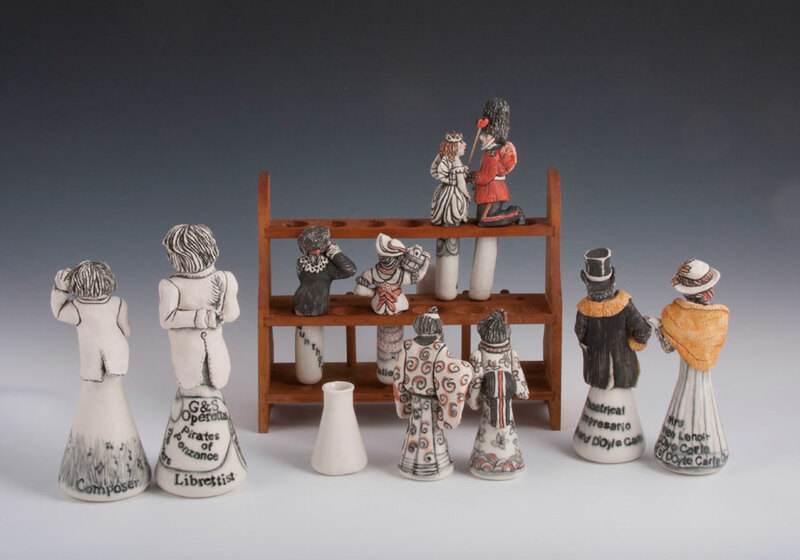 On the lower tier are the poet “Bunthorne,” who is in love with “Patience,” a milkmaid, characters from the operetta called Patience. 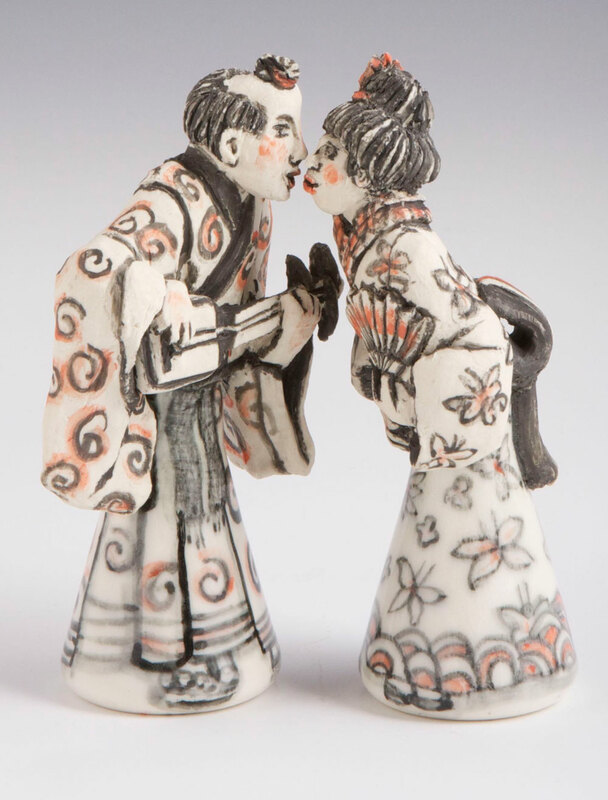 Free standing in kimonos are 2 lovers kissing, Yum-Yum and Nanki-Poo from the operetta Mikado. The couples in fur coats, in Erlenmeyer flasks, are Richard D’Oyly Carte and his wife Helen Lenoir D’Oyly Carte. They were the impresarios that discovered and funded the team of Gilbert and Sullivan to create their successful operettas. They also founded the Savoy Theatre in London that showcased the G & S productions. My kids, my husband and I have all enjoyed performing in G & S operettas at Interlochen Arts Camp, and in several groups around Boston. The operattas are performed world wide with great interest and comic contemporary interpretations. Danny Kaye, a charming American actor, singer, dancer, comedian recorded this song, as Bunthorne the poet, with the D’Oyle Carte Opera Company. I Cannot Tell What This Love May Be sung by the character of Patience, a milkmaid by soprano Elsie Morison with the Glyndebourne Chorus and the Pro Arte Orchestra. Conducted by Sir Malcolm Sergeant. 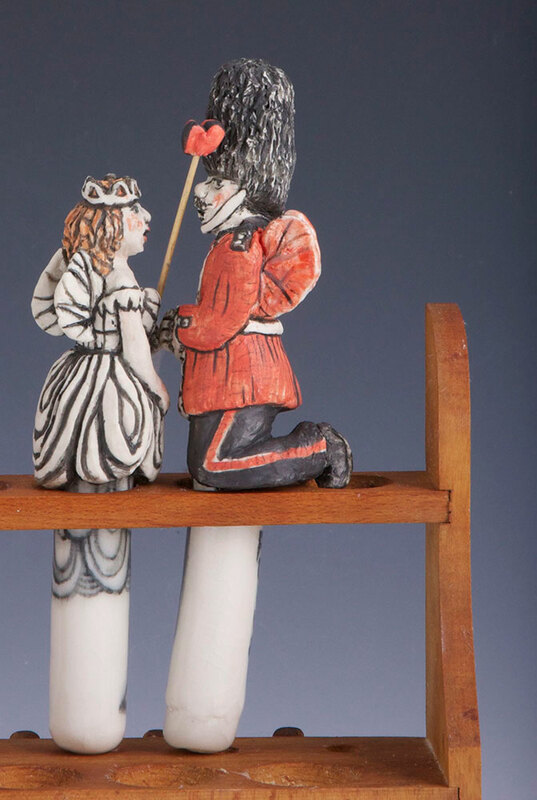 From Iolanthe: The Queen of the Fairies (who never grows old) in love with Private Willis, becoming a fairy guardsman. Nanki-Poo, the son of the Mikado of Japan, disguised as a wandering minstrel, and in love with Yum-Yum.